Introduction: In this article I have explained how to validate file type (i.e. file extension) and file size of the file or image while uploading through Asp.Net FileUpload control before actually uploading using jQuery. Description: It is very common requirement while working on asp.net project to upload image files e.g. jpg, jpeg, png, bmp, gif etc or document files e.g. pdf, doc, docx, xls, xlsx, txt, rtf etc. I got the same requirement where user can upload files. But I have to restrict user to upload only certain type of files and of up to specified size. This can be done both server side and client side. But to check the file type or size of file at server size through code, file must be first uploaded into server memory which is time consuming if the size of the file is large. So it will definitely degrade the performance of our application. To overcome this problem we can validate file type and size at client side using jQuery before actually uploading the file/image. //Check file extension in the array.if -1 that means the file extension is not in the list. // Check and restrict the file size to 32 KB. Explanation: User can now upload file of jpg, jpeg, png, gif, bmp type and up to 32 kb size. 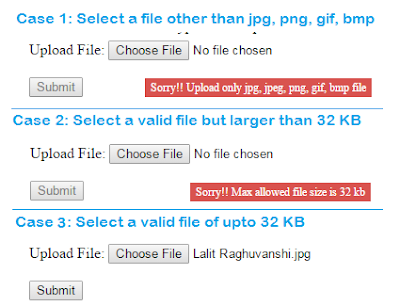 If user selects any other file or large file than the specified limit then appropriate message will be displayed to user and submit button will be disabled. When a valid file of up to specified size is uploaded then submit button will be enabled. Note: I have restricted user to upload up to 32kb file. If you want to restrict the file size to 2 mb then replace 32768 with 1024*1024*2 in above jquery script.